CATBALOGAN CITY – Daram (Samar) Mayor Dr Lucia Astorga received checks from the Department of Agriculture (DA) Secretary Proceso Alcala to finance a Daram project under the “Agrikulturang Pantawid Pamilyang Pilipino”. Mayor Lucia Astorga traveled all the way to Las Navas, Northern Samar to attend the launch of the “Agrikulturang Pantawid Pamilyang Pilipino” which was attended by Alcala and DSWD Secretary Dinky Soliman. In a text message, Astorga said that P220,000 was intended for the Cabugao and Casab-ahan farmer-families while another P170,000 was for the Valles and Cabiton-an Association. “This amount can help my constituents,” Astorga said. The project guarantees land development and employment opportunities for the sustainable livelihood of Pantawid Pamilya beneficiaries directly or indirectly dependent on agriculture. The launching was highlighted by the signing of a Memorandum of Agreement (MOA) signed by DSWD Secretary Dinky Soliman and DA Secretary Proceso J. Alcala. Under the MOA, both agencies identified the sites and beneficiaries of the project and consolidate farming operations for the Pantawid Pamilya beneficiaries. With Region VIII as the pilot site, the project also seeks to demonstrate innovative farming systems technology, showcase agricultural modernization efforts and adopt the project’s developed technologies and its farmer-beneficiaries. After six months of implementation in Region VIII, the project will be rolled out in other regions to ensure its sustainability. “The Agrikulturang Pantawid Pamilyang Pilipino project also aims to prepare and encourage the younger generations, such as the children of the beneficiaries to go into agricultural farming through trainings and social preparations. 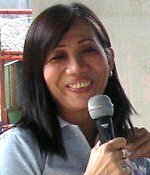 The goal is to propagate the project to provide sustainable livelihood for the beneficiaries and their children,” Secretary Soliman said. CATBALOGAN CITY – Augmentation forces for the Catbalogan police will soon be arriving for the Christmas holidays. This was the gist of the statement given by Police Superintendent Avelino Doncillo in an interview with PIA-Samar, Thursday. “First, some 32 PNP elements were downloaded to Catbalogan, then another 35 PNP recruits undergoing field training will be dispatched very soon to increase our police visibility,” said the Catbalogan police chief. He added that the policemen will be deployed in crowded areas in downtown Catbalogan. It will be recalled that during the Pacquiao-Marquez fight, in broad daylight three hold-up men stormed LBC and carted away more than half a million pesos cash, however, the police claimed charges have been filed against the offenders identified through the CCTV cameras. Aside from police visibility, Doncillo said he will coordinate with the Samar police provincial office fires and explosive unit for them to disseminate information on air about their operations to regulate the selling of firecrackers. Later, they will inspect the firecrackers stalls and extend the full force of the law if there will be violators. “The Letter of Instruction (re Firecrackers) has long been there, all we need is to review this, remind the firecracker business community to make sure that those they sell are allowed by law,” Doncillo explained. “I wish that Catbaloganons will have a safe Christmas and it can be done if they will also support the police, obey the laws, ordinances and provide bits and pieces of information if needed,” added Doncillo. The challenge to secure half a million Catbaloganons and even more from nearby municipalities doing shopping in this commercial area has fallen on this PNP officer and his men. CATBALOGAN CITY – The ‘Light a Tree’ contest that ushered Christmas Festival in Samar’s capitol grounds has been attracting an unprecedented nightly crowd. This was the observation of vendors who have also mushroomed on the capitol park to cater to the crowd every night. Some 80 offices, NGOs and civil groups have joined the contest. Their "trees" has been lit on December 3, 2011 and have since then continued to be improved by additions of more lights. The whole three-hectare area of the Capitol is glittering with colorful Christmas lights and the sound system blaring with Christmas songs. SAMELCO 2 corner, which is heavily lit, is a mini village with nipa huts, with ‘linemen’ on the job and a giant Christmas tree in the midst. Another interesting entry is that of the army where the ‘nativity tableau’ is guarded by army elements in full battle gear. Still another is a mini-ship from the Coast Guard where the ‘nativity’ is set on the boat’s deck complete with animals copied from the real Belen. Thus, young and old alike are drawn towards the capitol park at night despite the intermittent rains that pour in the evenings. Budoy who sells popcorns have to ‘pop’ corn several times as it sells briskly with young promenaders at the park. “Last Sunday, when the weather was fair, we sold P3,000 worth of popcorns,” he said. Popcorns, barbecue, palamig and other street foods line the perimeter wall of the capitol in the evenings, with business operations lasting up to one o'clock in the morning. On Saturday, December 17, the 80 contestants of the ‘Light a Tree’ will face the final judgment with P50,000 cash prize for the first prize and on Sunday, is the great Christmas Party to be sponsored by the provincial government under Gov. Sharee Ann Tan. MANILA – “Establish “firecracker and pyrotechnic zones” where people may light firecrackers and pyrotechnic devices in celebrating Christmas and the New Year. Thus, Interior and Local Government Secretary Jesse M. Robredo on Thursday asked provincial governors, city and municipal mayors and punong barangays throughout the country in an effort to minimize casualties that goes with the revelry this holiday season especially on New Year’s Day. “Let’s strive to minimize or even go for “zero casualties” in firecracker-related injuries and incidence of fire this Yuletide season,” Robredo said. “And the idea of designating a specific firecracker and pyrotechnic area in a community could help a lot in attaining our objective,” he added. The DILG secretary enjoined local chief executives to regulate the sale, manufacture, distribution and use of firecrackers and other pyrotechnic devices in their respective localities as mandated by Republic Act 7183. In his directive, Robredo urged local authorities to see to it that only the following types of firecrackers are manufactured, sold, distributed or used namely, baby rocket, “bawang,” small triangulo, pulling of string, paper cups, el Diablo, Judah’s belt, sky rocket (kwitis) and other types equivalent in explosive content. For pyrotechnic devices, those that are allowed are sparklers, luces, fountain, jumbo, mabuhay, Roman candle, trompillo, airwolf, whistle device, butterfly, among others. Robredo also directed local officials to take the lead in the conduct of an information campaign on the proper use of all kinds of firecrackers and pyrotechnic devices, and to be watchful of radical groups that may take advantage of the holiday season’s merriment for their lawless designs. TACLOBAN CITY – An additional P1.93 Billion budget for East Visayas infrastructure project was released in the last quarter of 2011, the Department of Public Works and Highways in the Region informed. This is more than the P1.8 Billion budget for the entire year, thus making DPWH Region 8 the only region in the country with additional budget higher than the regular budget, DPWH-8 Director Rolando Asis said. Director Asis explained that the additional fund is part of the stimulus package of the Aquino government that is aimed at boosting the infrastructure spending in the Region. With the additional releases, the DPWH in the Region has to fast track works for ongoing projects in order to achieve at least 80% accomplishment by the end of December, the DPWH director added. Director Asis said that among the projects covered in the additional budget are the road opening connecting Babatngon and Barugo towns in Leyte; diversion road construction in Calbayog City, San Isidro-Lope de Vega road opening in Northern Samar; Arteche-Lapinig Road improvement linking the provinces of Eastern Samar and Northern Samar; and the rehabilitation of the Carigara Bridge in Leyte. The DPWH director disclosed that for the regular fund allocation, “we are almost complete,” however, due to additional allocations for the last quarter, it is impossible for the Agency to attain 100% accomplishment. He however gave the assurance that the agency will continue the implementation of the projects early next year. In earlier reports, the DPWH justified the low spending in the first half of 2011 as a result of its move for quality spending and realignments requested by politicians and people themselves. KANANGA, Leyte – The Army’s 19th Infantry (Commando) Battalion and 82nd CMO (Busilak) Company in coordination with the provincial government dispensed today a total of 600 food packs to three barangays in Leyte. The activity benefited some 600 indigent families in barangays Mahawan of Kananga, Tinaguban of Carigara and Tabangohay of Alang-alang through a simultaneous gift giving and feeding dubbed as Pamaskong Handog 2011. According to First Lt. Philip James Hocson, Civil-Military Operation Officer of 19th IB, the Pamaskong Handog 2011 is a joint initiative which aimed to alleviate the condition of indigents and revitalize the Filipino’s tradition during yuletide season. Priorities of the said activity were indigents residing in remote barangays. Receiving food packs and warm arroz caldo distributed by soldiers is not a common scenario in Brgy. Mahawan of Kananga, Leyte. But for the constituents of Brgys. 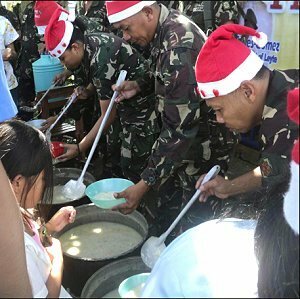 Tinaguban in Carigara and Tabangohay in Alang-alang, gift-giving is an ordinary venture rendered by the soldiers. It can be recalled that 19th IB in coordination with the Kiwanis Foundation International (KFI) handed out school supplies (notebooks, paper, pens, pencils and sharpeners) to one hundred thirty-three (133) pre-elementary and elementary pupils of Brgy. Tabangohay on September 28. Likewise, three boxes of assorted medicines were dispatched for Brgy. Tinaguban during the launching of the Army-led Pamaskong Handog 2011. Lt. Col. Cabugon, Commanding Officer of 19th IB expressed his gratitude for the support extended by the provincial government of Leyte who co-sponsored the month-long activity. “We are grateful to Gov. Petilla for granting us our request. These goods may only feed the recipients for one day but the good action extended by the local government will always be remembered”, Cabugon said. TACLOBAN CITY – The Lingganay Festival of Alangalang, Leyte was recently given a P700,000 financial assistance from the provincial government of Leyte as it vies, for the first time in the nationally acclaimed Sinulog Festival in Cebu City this January. According to Leyte Governor Carlos Jericho Petilla, this is one of the province’s commitment to support and maintain Leyte’s cultural heritage by engaging local festivals in national festival competitions as colourful and prestigious as the Sinulog Festival. Gov. Petilla said maintaining a contingent to be fielded in various festival competitions around the country is no joke, considering the preparation – both physically and financially just to be able to compete. “I am sure it’s no easy task for the Lingganay as they will be bringing the name of the province as it competes in January,” Gov. Petilla said. However, he added, competitions such as the Sinulog is a big opportunity to promote the town – its cultural richness as well as its economic viability. Meanwhile, Alangalang Mayor Loreto Yu lauded the governor for his unending support to make the various festivals in Leyte grow and flourish on its own. 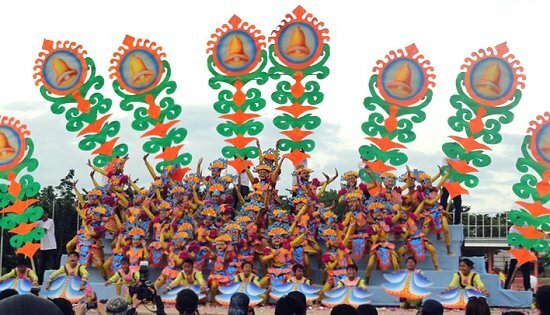 He reported that already, the Lingganay contingent are deep in practice even as the Christmas seasons begin this December, to fully prepare for the Sinulog competition. The Sinulog Festival is held every third Sunday of January. In 2011, Abuyog’s Buyogan Festival earned the second place to Placer, Masbate’s grand champion spot. Alangalang’s Lingganay Festival was the grand champion in the 2011 Pintados-Kasadyaan Festival of Festivals and, together with second placer Karatong Festival of Dulag, earned the rights to represent the province in the Sinulog as well as the Aliwan Fiesta in Manila during the summer next year. For the 2012 Sinulog, festival organizers are also expecting contingents from Masbate, Negros Oriental, Tacloban City, Dulag and Alang-alang in Leyte and Eastern Samar; while, contingents from Mindanao, Tangub City, Zamboanga Del Norte, Cotabato and Lanao del Norte have also signified interest. A whooping P1million cash prize awaits the grand champion in the 2012 Sinulog Festival. QUEZON CITY – “Definitely it is not democracy at work but a communist instigated move to discredit our country’s constitution and pillars of government,” said ANAD Rep. Jun Alcover in reaction to the filing by the House of Representatives of the 8-count and 57 pages impeachment complaint against Chief Justice Renato Corona. “Admittedly, any impeachment case and proceedings is but a numbers game. Nevertheless, what transpired last Monday (Dec. 12) is definitely one destined for the Guinness Book of World Records,” he said. Rep. Alcover explained that right after the roll call for members present, it was immediately reported out in plenary that 188 members of the House of Representatives signed the impeachment complaint against Chief Justice Corona and approval was made without any discussion by among the members. “The majority effectively blocked the moves of the minority to verify the signatories of the complaint. Indeed, it was through in just about an hour or so from the banging of the gavel to formally open the day’s session!” the pro-democracy solon said. Rep. Alcover disclosed that in the sidelines, a number of those who signed the complaint told him saying, “I signed because we were told to do so and besides I can’t do anything against it with the 2012 PDAF plus the additional P1 million to our PDAF for every Congressman, dangled before us. Also, copies of the impeachment complaint were selectively distributed and only for the majority block Representatives. Surely, we in the minority were left in the dark without even a page of the complaint to read,” Rep. Alcover added. “Whether this is true or not is for the majority to respond and explain to the people in the light of their own crusade for transparency in governance. But there is a possibility of truth if we compare what happened yesterday to the impeachment case against then Ombudsman Merceditas Gutierrez when it was up for decision by the House in plenary session. In the latter, there was a high Malacañang official, while occupying an office of a Congressman-ally, talked to a number of Congressmen explaining the millions of reasons in asking for the latter’s favorable vote,” he explained. “What happened yesterday (December 12) is the exact replicate of how the Maoist terrorist Kangaroo Court does their thing. Things were rammed on one’s throat and in record time! Undeniable and too obvious are the hands of Maoist terrorist and Smiling communist personalities stirring the situation and conditions to benefit their respective objectives,” Rep. Alcover stressed. “The picture is clear where the Maoist terrorist and Smiling communist Representatives, in the majority block, are enjoying the perks and bonuses from PNoy; while prodding their respective sectoral front groups to hit at PNoy using scathing name-calls and accusing him with nasty things. These are vivid proofs on how these groups operate and pressure government, at will. But, it seems PNoy is enjoying this treatment with his ego constantly titillated,” he said. TACLOBAN CITY – Kalanggaman Island in Palompon town will banner Leyte’s tourism promotion efforts for 2012 and highlight the area as a prime tourist destination in the province. Leyte Governor Carlos Jericho Petilla, who recently toured the island said, that the province will support promotional efforts of the local government unit of Palompon to attract more local and foreign tourists to the area. However, Gov. Petilla said, the province’s role would be to invite investor to finance construction of more tourism facilities as well as develop the area to draw more tourists and visitors. “We know that developing the area would cost a lot for the LGU. Interested investors would be a big help,” Gov. Petilla said. Palompon’s Kalanggaman Island and Tabuk Marine Park and Bird Sanctuary is part of Leyte’s Northern Alliance for tourism promotion which together with Canigao Island in Matalom, Digyo Island in Inopacan, Seven Island Destination in Tabango and Baybay City are being primed as major eco-tourism spots in Leyte. The governor however warned the Palompon LGU to maintain Kalanggaman’s environmental richness and not to disturb its natural sorroundings. Overcrowding the island with tourists would not equate to sustainable tourism he said. 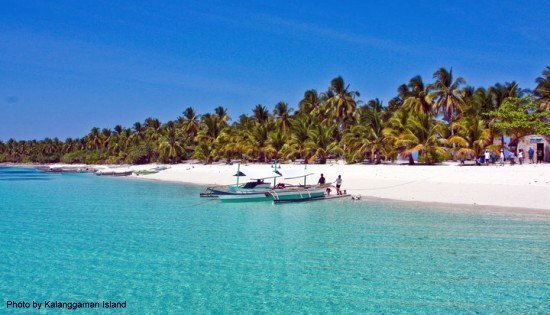 Kalanggaman Island boasts of clear turquoise water surrounded by white sand with some rocky part. The eastern and western tips are sandbars that blend well with the color of the water. Dwarf coconut trees are scattered in the center, while rich and colorful marine life is resting underneath. Tourist Police has already been deployed to the area through the Leyte Norte PNP Provincial Command. to provide security to the tourist populace and to ensure their safety. A Tourist Assistance Desk has also been established to readily answer inquiries and respond to request for police assistance.